Taking a knee is about black lives, not Donald Trump. It’s become comfortable at the expense of achieving meaningful change. #ScientistsTakeAKnee has become too comfortable. Becoming an academic, like becoming a professional football player, is a high-stakes path. Most people won’t actually make it. For better or for worse, they are careers where timing is everything, the help of others is paramount to success, and luck plays an important role. And then there’s the culture: If you don’t fit in, it’s much more likely you’ll fall out. Football, like academia, is a culture of hierarchy where people in positions of superiority demand respect and expect cultural conformity. When Colin Kaepernick decided to sit down during the national anthem in August 2016, he was breaking a significant cultural rule: Do what the rest of the team does, do what the league tells you to. Kaepernick intended to use his position as an internationally televised quarterback in the National Football League to make it more difficult for white American viewers to look away from his reality as a black American man. Rather than celebrate America, Colin Kaepernick sat down and demanded that people watching pay attention to police brutality and more broadly the anti-blackness which is fundamental to the fabric of America. The NFL has punished Kaepernick for his protest by destroying his career. But his point has been made. Kind of. Thanks in part to Donald Trump’s keenly savvy use of political rallies and social media, even Kaepernick’s fiercest critics (hey, Ray Lewis) took a knee or stood and linked arms on the field during NFL games on Sunday and Monday. What they were taking a knee for had become kind of murky. What was clear was that the NFL had sanctioned it—even Roger Goodell, notoriously useless when it comes to advocating for human beings, and Robert Kraft, who donated $1 million to Trump’s inaugural committee, put out statements expressing disappointment in Trump. Once it became apparent that taking a knee could be “just a protest against Trump” suddenly lots of folks were doing it. Much like with the March for Science—which took clear inspiration from the inauguration weekend Women’s March—scientists saw an opportunity to make their opposition to Trump’s agenda known. On Tuesday morning, as #ScientistsTakeAKnee trended on Twitter, a lot of people were talking about why taking a knee mattered. But by 10 a.m., only one of those tweets included a photo of someone actually taking a knee. Beyond that, the act of taking the knee has never been the point: How many of them actively intend to protest police brutality, anti-black segregation of socioeconomic resources, mass incarceration, and the myriad other forms of anti-blackness that Kaepernick has talked about over the years? It’s not clear because unlike University of Michigan graduate student Dana A. Greene Jr., who took a knee in public for 20 hours straight, few people took the time to make an extended statement beyond one tweet from the privacy of their office or lab. Kaepernick’s taking of the knee successfully started a national conversation that is now impossible to ignore because it was broadly visible and disrupted business as usual in the NFL. Part of what got the conversation going was that Kaepernick was willing to put everything he had worked for on the line because Black Lives Mattered that much to him. As an academic, I empathize with the situation he found himself in; the resistance to change in science is so significant that in order to advocate for it, I have had to be publicly outspoken in ways that put my own career and development at risk. Because the only way to effect meaningful change was to take risks. 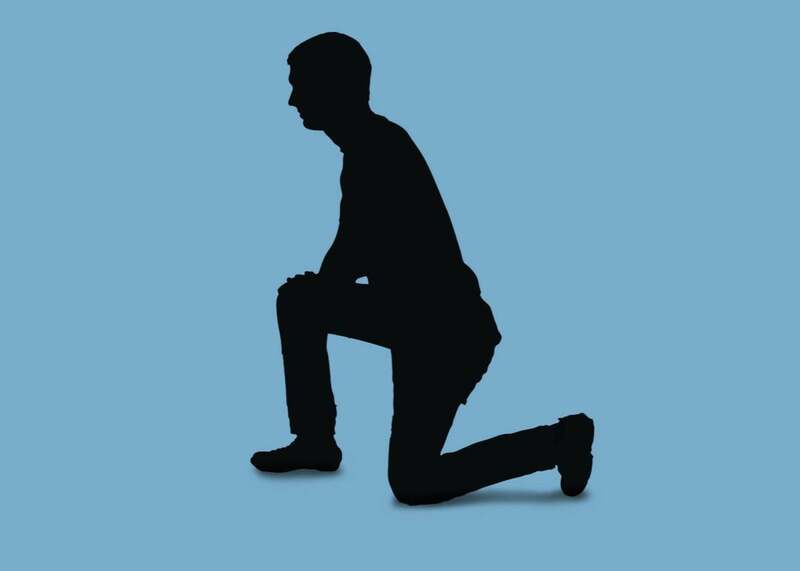 #ScientistsTakeAKnee won’t have the same impact on science that Kaepernick had on football—and America—because no deeply ingrained beliefs about the status quo are being genuinely challenged. Scientists taking a knee do not disrupt business as usual at all. It’s a nice show of solidarity, but like the many players and owners who suddenly decided to get in on the action over the last few days have shown, it’s now possible to take a knee while doing nothing substantive to ensure Black Lives Matter. At this point, it is performative and it’s not even always clear what message it’s supposed to send. While it is a performance that matters and will probably give some people solace, academia needs to do more than tweet about pictures they took on their coffee break. What would make the protest matter more? Scientists need to disrupt their own lab spaces the way Kaepernick disrupted football’s (relatively new, let’s remember) patriotic traditions. The space young black scientists have to navigate is still nearly impossible. Black scientists are not just scientists but barrier-breakers. We still must put ourselves at risk if we dare to make room for ourselves in this world, if we dare to combat racism in the scientific community and to sanctify all black lives. When I demand that my professional societies publicly speak out about injustices like anti-black racism and anti-native colonialism, there are too many people sitting at their lab benches or in front of their 3-D universe simulations trying to ignore me—or worse, labeling me an organizational enemy for speaking up. As I send out faculty applications this fall, I’m aware that rather than seeing this as a strength, many job committees will see my activism as a weakness that will not positively impact my science or their department. Producing the next generation of scientists is fundamental to our field’s survival. This includes training black Americans as well as others. When fighting for black lives is not treated as a positive contribution to science, black scientists and students alike receive the message that we are not worth fighting for as human beings, and have no potential as scientists. It’s harder for me to focus on my research on dark matter Bose–Einstein condensates (so hot right now that even a Nobel laureate is taking up a similar research program) when I constantly have to fight these wars, too. #ScientistsTakeAKnee can have real impact if it is to start a movement against the status quo, an activity that undergirds substantive action to combat racism in the scientific community while giving me some breathing room to just enjoy my research. If taking the knee just becomes an easy, relatively comfortable way to flip the bird at an unpopular white supremacist president, that might help some allies let off some steam. But it won’t help me and the other scientists like me who are putting our careers on the line for this. For Kaepernick, the knee was always just the symbol. Within the scientific community, we need to admit that symbolism is never enough.